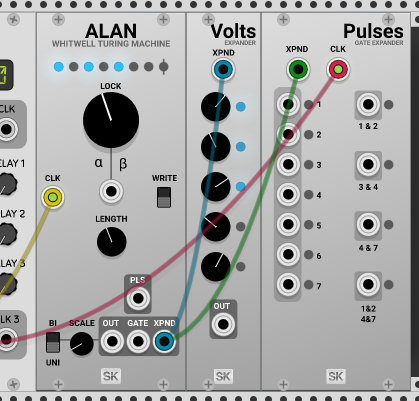 An open-source implementation of the Turing Machine, called ALAN, which also includes: the vactrol mix expander, the volts expander, and the pulse expander. A multi-channel sample and hold for adding color to notes. Mac build added (do you want to give me push access again and I’ll try to keep the Mac builds updated)? The ALAN is based on the technical paper for Tom Whitwell’s Turing Machine and an amazing demo video of a real one, while the faceplate is a combination of component library and @David’s design template. It’s not the first turing machine, or the only one, but it’s pretty and it’s fun to play with. Finished the pulses module and added it to pre-release. It works both as a gate (when there is no clock) and as Whitwell’s module does when a clock is provided. 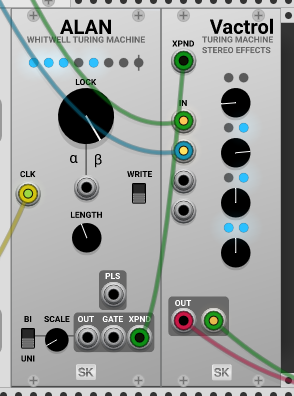 Contemplating either a Noisering style module that is compatible with the XPND port (and thus the pulses and volts) or some kind of multi sample-and-hold in the spirit of that thread talking about modules to randomize other modules. cool Skrylar, let me know if you are needing some graphics!! Slowly integrating the ones you made as I figure out how to get them in the code. Light versions of the plugs are in the pre-release of skylights, probably headed towards JACK after the Windows stuff is sorted out there. Pre-release now includes the Vactrol Mix Expander. This is the last of the three turing machine expansion boards and the one which allows you to create randomized stereo landscapes. Skylights sounds great. If everything basically works (i.e. doesn’t crash), even though it’s not feature complete yet, I would highly encourage you to submit this to the Plugin Manager. That would be great, thanks! Thankyou for these excellent modules! Heres a quick generative percussion patch utilizing them. Is there a Mac version to test?